Are you looking for some innovative idea for your next giveaway? Well look no further because this customized keychain is the thing you are looking for. This stylish yet chic looking giveaway will definitely enhance your brand image amongst your clients. Read on more to find out how you customized keychain can improve your business and sales. Lord and Taylor, an online departmental store, offers this customized keychain. Simply purchase $85 and receive this beautiful timeless piece together with your purchase. The sleek design and mesmerizing stones sure catch the attention of many passer-bys! Why offer a customized keychain? Well, many people offer a variety of things in their giveaways, and how can you stand out from the rest, yet generate the same effect? Keychains are the greatest alternative! It is practical and your customers can use it in their daily lives, it is also able to generate interest when it is shown to the public! 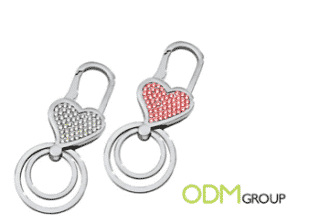 People use keychains for their keys, double up as a phone accessory or simple attach them to the bags or laptop cases. In this way, our giveaway is able to increase its marketing value because the object is being shown to others easily. This can help to generate interest amongst the public and inquire more about your brand! Not only that, because it is so easily used, your customers will use it and it becomes part of their daily live. Thus, increasing brand recognition and brand loyalty with you. Party Hard on a Ladies’ Night out with this Promo Gift! Feel Elegant with Estée Lauder’s GWP Pouch! Feel free to contact ODM asia to inquire more about your next giveaway. We will be waiting for your mail!